Dinan's Free Flow Exhaust provides increased flow in your 650i Coupe for power gains without the excessive noise associated with typical ''performance'' mufflers. Special Note: This exhaust is for the Coupe only. Dinan's Free Flow Exhaust provides increased flow for power gains without the excessive noise associated with typical ''performance'' mufflers. The Dinan exhaust features 3 1/2'' stainless steel polished and laser engraved tips. Using Rigid and durable muffler cases, Dinan exhausts are manufactured from 20 gauge 304-stainless steel for optimum corrosion resistance. Internally, the systems feature Dinan's Tuned Resonance Chamber technology which provides the optimum balance between maximum power gains and a civilized, yet sporty exhaust note. 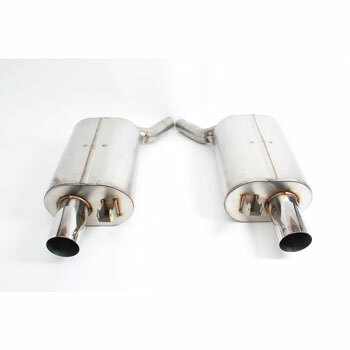 The Dinan exhaust also provides substantial weight reduction compared to the stock muffler.